Coffee oil is cold pressed from the coffee beans harvested still green, crushed mechanically in a cold expelled pressing machine yielding a greening light oil. It does not smell either like brewed coffee or coffee essential oil which is made from roasted coffee. When roasted there is a change in the chemical and aromatic composition of coffee beans. 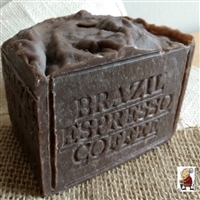 Our coffee oil comes from a coffee farm in the South of Brazil . Coffee oil helps to control symptoms of skin disorders such sores, itchy, scaling and dead cell build up. Acne - coffee oil contains enzymes that stimulate detoxification and help in cleaning the skin, thus making it ideal to help skin prone to acne. Besides caffeine, coffee oils is excellent source of linolenic acid, oleic and palmitic acids the great potential of coffee is its high content of flavonódes which protects the skin against UV rays as well as help in the treatment of injuries caused by excessive sun exposure. Coffee Oil has been used for years as a beauty treatment and is now being used by some of the most famous spas in the world to purify the skin and for the treatment of cellulite.